1. To pass laws for the good governance of Uganda. 2. To provide, by giving legislative sanctions taxation and acquisition of loans, the means of carrying out the work of Government. 5. To vet the appointment of persons nominated by the Presidentunder the Constitution or any other enactment. The Vice-President and Ministers who, if not already elected Members of Parliament, shall be ex-officio members without the right to vote on any issue requiring a vote in Parliament. 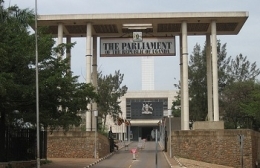 Parliament is presided over by the Speaker, and in his/her absence, by the Deputy Speaker both of whom are elected by Members of Parliament from their number.